Your website is up and running. And all you know it is getting your visitors and customers. However, what you don’t know a significantly high percentage of your visitors are leaving the website without buying anything or without “converting”. That’s where you need to understand the concepts of conversion rate and bounce rate. Let’s start with simple definitions. First you need to understand the idea of “conversion”. It refers to the number of visitors you successfully pursue to take actions you want them to take. For example, an e-commerce website might have the goal of selling something to its visitor, a landing page might have the goal of redirecting the visitors to its main page and a blog might have the goal of getting email addresses of its visitors so they can use it for marketing. Conversion rate refers to the percentage of visitors successfully converted. Bounce rate refers to the percentage of visitors leaving the first web page of your website in a very short time without visiting another web page. Although the definition of “short time” is not clear but visitors leaving the website after visiting only one web page “usually” considered bad. Why “usually”, you might ask. Because most of the time conversion rate and bounce rate have inversely proportional correlation. When the bounce rate is high (mean people are leaving the website very soon) that means your web page is not converting them. However, in some cases this relationship could be a little more complicated. For example, Google has the highest bounce rate ever possible and probably the highest conversion rate too. Google is not the only example; if your website has a “contact us” page with your phone number, address and other relevant information. Someone looking for your phone number would search it via search engine and would leave the contact us page as soon as possible. It still means the page has a high conversion rate. How to Reduce Website Bounce Rate? Regardless of the complicated correlation between bounce rate and conversion rate, it always helps if your visitors spend more time on your website. 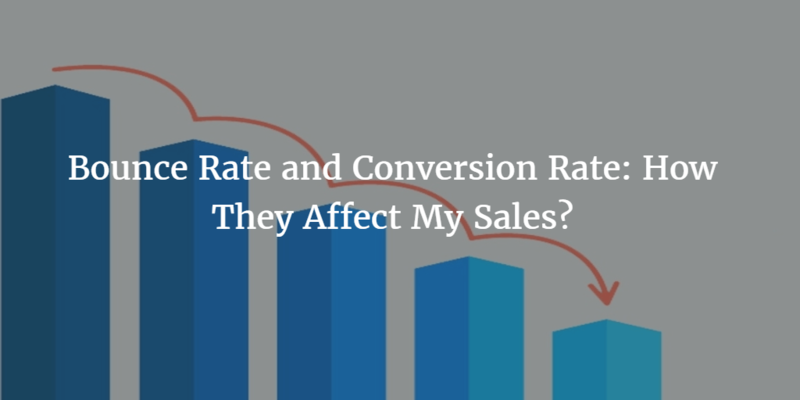 Let’s see why your website has a higher bounce rate and how you can reduce it to indirectly increase your conversion rate. This is the most common reason; if your website does not look good, most of the visitors would leave it. This could be due to inappropriate colors, fonts, font sizes and many other visual elements. Incorporate a good design on your website so it can appeal visitors. If your website (or some web pages of it) does not work as expected or as advertised, it would repel people. This rarely happens but it does. So test everything on your website before launching it. Unless your business is highly tech relevant, most of the visitors would have very little knowledge of the web technologies. It is your responsibility to make things easier for them. Use good layout, well functional design, incorporate easy navigation and remove technical errors. Call-to-Action refers to the next step you want to propose to the visitor. In case of an e-commerce website it would be a shopping cart and checkout button so visitor can easily see what to do next. In case of a blog, you need to make it easier for users to share the post on social media. In other words, whatever you want visitors to do, the steps must be clear. By superadmin| 2017-02-21T15:22:10+00:00	January 21st, 2017|Categories: Beginner, Ecommerce, Marketing|Comments Off on Bounce Rate and Conversion Rate: How They Affect My Sales?